You have a favorite cut of steak, and you like it cooked either medium, medium rare, or well done, right? 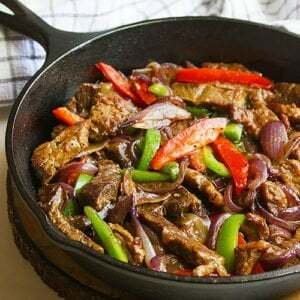 I enjoy steak too, and my favorite cut is chuck but I love my meat juicy and tender, so in this pepper steak recipe, we won’t cook the steak for 12 minutes because I want it to almost melt in my mouth. Let’s not fight over how to cook steak, none of us will win, everyone like his steak prepared in a certain way. 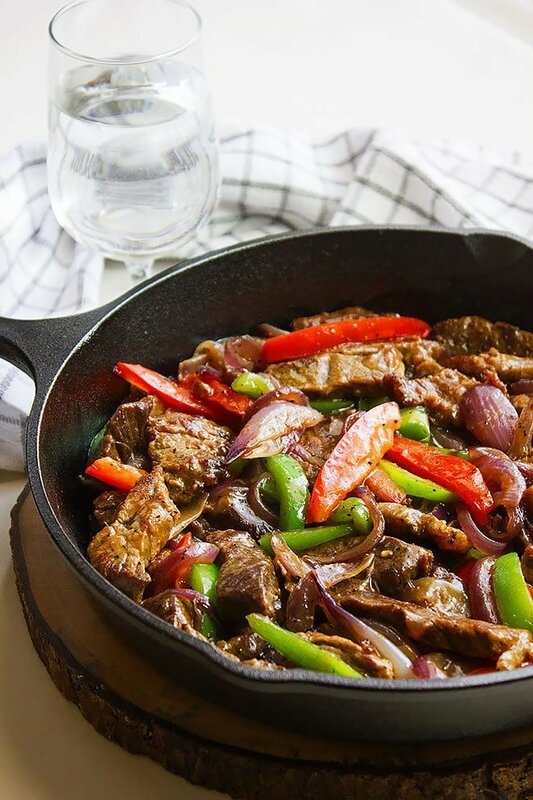 In this post, I will share how I made pepper steak, and you have the choice to follow your method of cooking steak, but I can promise you one thing, you’ll enjoy having it! Pepper steak with white meat?! Oh, and if you don’t like red meat you can use chicken or fish instead. 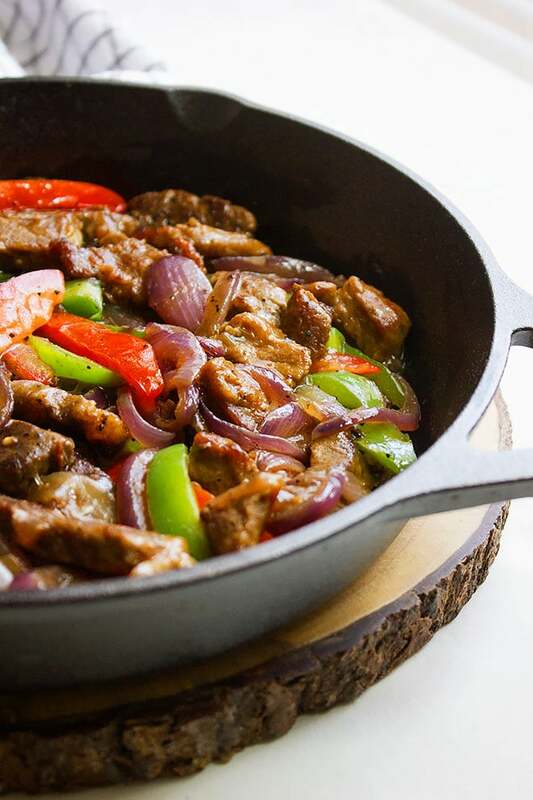 The sauce used in this pepper steak recipe goes well with any meat. In case you went for white meat don’t overcook it. When I share a recipe with you, I like for you to try it as is and then add your touch to it. Cooking the dish as per the recipe instruction, gives you an idea of how the combination of ingredients will taste, according to the outcome you can add or omit ingredients. Pepper steak is a great dinner, it is quick to prepare, and you don’t have to spend a lot of money on an expensive cut of steak. The spices and the vegetables used to create a delicious flavor that will wrap each slice of steak. Serve pepper steak with mashed potato or rice (brown or white) on the side. No matter what you do, do not use frozen pepper in making pepper steak. The frozen pepper will turn out soggy and will ruin the taste of the sauce. You need that crunch in your pepper, so please always use fresh peppers when making pepper steak. The ingredients below most probably are in your kitchen, and I guess you know what I’ll say next! 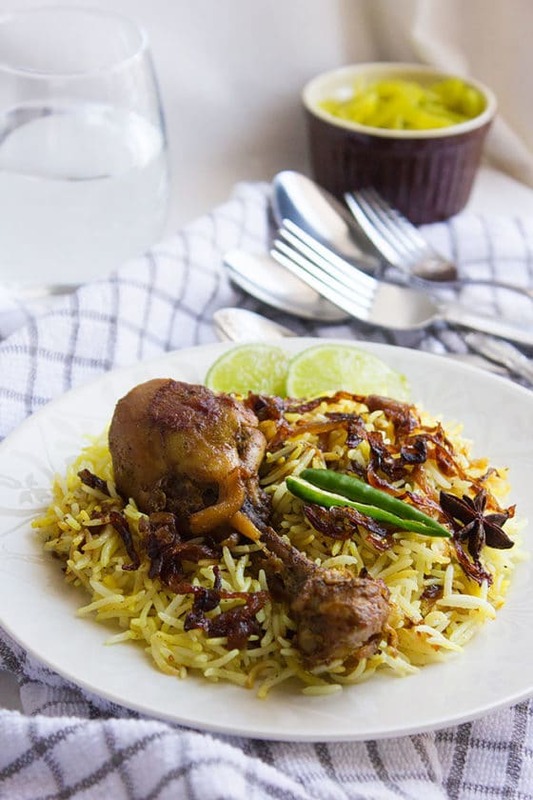 Run to the kitchen and make this dish tonight! Let’s make some Pepper Steak! In a pan, add three tablespoon oil and fry the chuck in two batches until brown on both sides. Remove and keep aside. In the same oil fry the onion until translucent. Remove and keep aside. In the same pan, fry the bell peppers for few seconds and keep aside. Add the fried chuck back to the pan, Season the chuck with salt and black pepper. Add two cups water and let it cook on medium heat for 45 minutes or until the meat is tender. Add water if the meat is still tough and continue cooking. When the meat is cooked add the onion and bell pepper. Mix the sauce ingredients and pour over the steak, stir until the sauce thickens. That sounds really tasty! I think peppers and onions were made to go with steak. 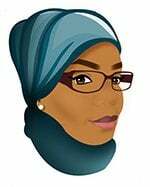 Although I don’t eat meat I do cook it every night for my husband. I’ve never tried pepper steak before because I thought it was too complicated. I appreciate the recipe and the printable! I’m going to try it. I know a few meat lovers who would enjoy this. I used to eat steak but have cut out meat now. You can use the same recipe using your favorite vegetables! They all look absolutely delicious. I am having some friends over on Sunday and the Pepper Steak is a must! The recipe is quite easy to follow too! 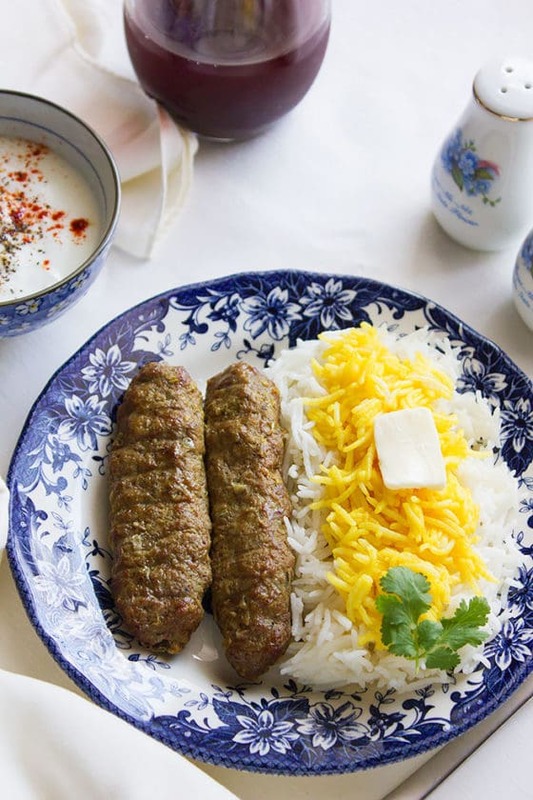 I would like to try this recipe using white meat because beef is so expensive here. It looks so delicious! I am drooling. This looks so delicious. I don’t think I’ve had pepper steak in a long time. You have me the best idea! I’m going to try this recipe using chicken breast. Thank you so much. You are most welcome Dona, chicken is a great substitute. My mom would totally love this recipe. She is a huge fan of peppers in her dishes. Hope she enjoys my version! This looks SO good. I love a hearty dinner recipe like this. This looks amazing! I bet it would be goon on tortillas as well as rice! I can’t wait to try it out! This looks lovely, although I am cutting down on eating meat. Is there anyway to make the recipe vegetarian? Am a great lover of meat this meal will go down well with me. thanks for the recipe. I don’t eat meat, nonetheless, this looks delicious! I would probably give it a try and make it and probably replace the meat with tofu. This recipe can turn vegan and vegetarian easy, hope you enjoy it! Yum! This looks amazing! 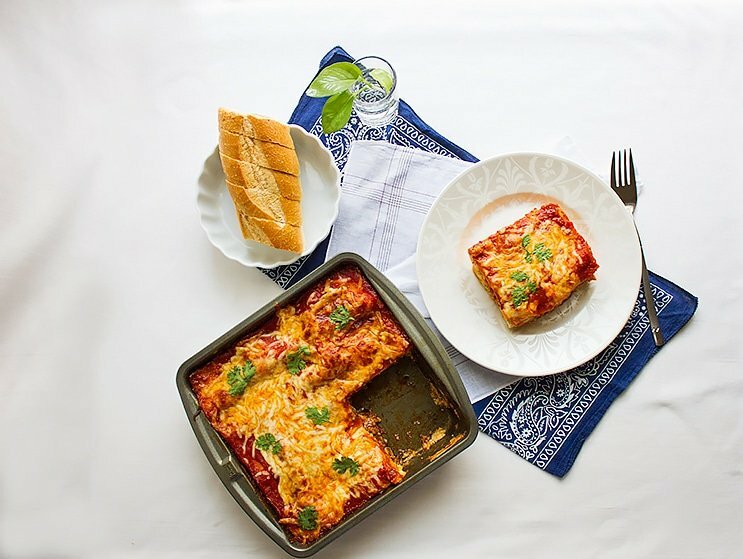 I wish I had the ingredients so I could make it for dinner – perhaps this weekend instead! Your dish is undeniably delicious. How I with I could cook well too. Thumbs up! I’m not a big eater when it comes to steak but my family is. I’m going to try to make this. I know they’re going to like it. Thanks for the recipe! 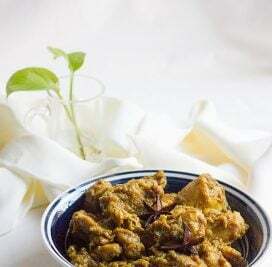 I think red meat is the way to go but I’m sure white meat with this recipe is just as great. You are definitely right we all cook our meals differently but that’s a good thing because it leads us to share. You are right Sondra! 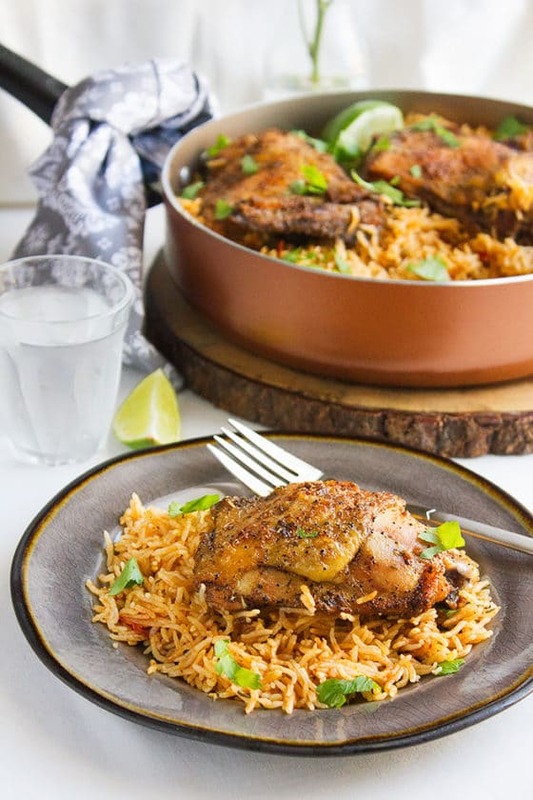 Chicken also go well if used in this recipe instead of the beef. Oh wow those dishes look super yummy!! I will have to make them! These are all great dishes. 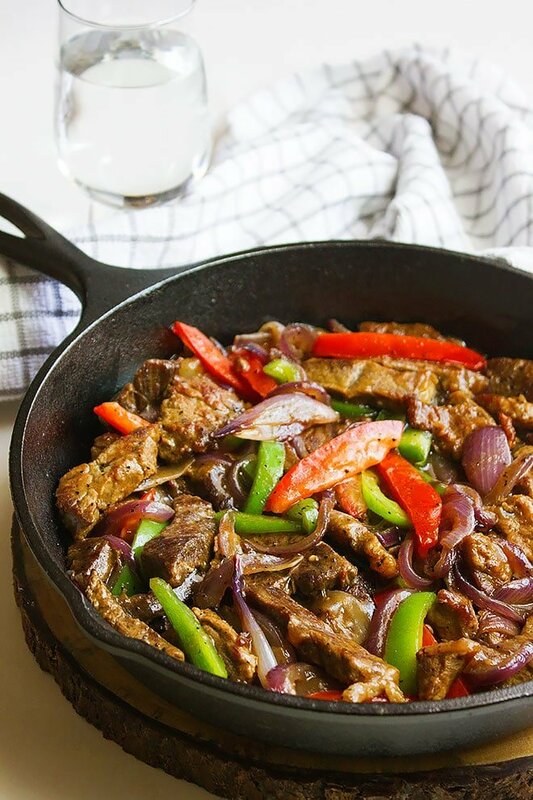 Pepper steak with onions is one of our favorite dishes. This recipe I will have to try for sure. Thanks for sharing the recipe. I love this dish! I make the pepper steak with onions for my boys and chicken for myself. Both goes great over a bed of white rice. Quick and hardy meal for my entire family. Love it!! Just saw your recipe for pepper steak. Sound’s delish! Is there a conversion to make it in crockpot? I work and don’t usually have 45 minutes or more to cook in evenings. Any suggestions will help! Hi Tena, Using crockpot you can cook this dish on high from 3 to 4 hours, on low you can cook it up to 8 hours. Hope this helps. This recipe sounds wonderful. I bought everything to make it for supper tomorrow. I do have a question. When you add the water to the beef to cook for 45 minutes, you don’t cover the pan? Just want to make sure it turns out good. Hi Jeri, I didn’t cover the pan while cooking this pepper steak. I haven’t made pepper steak in awhile. My daughter grandmother use to make it until she passed. I love your recipe because it’s similar to the way I made it but the only thing I did different was, I didn’t add water to the meat. I just seasoned the meat (I used ribeye) and cut it myself. I also put a little sauce to marinate in until i was ready to cook it then I cooked it like hibachi style then I took it out & cooked the veggies with fresh garlic. I like a crunch to my veggies so it was more like a quick little char. I made the sauce as instructed but I used a little teriyaki sauce also then I added the meat & veggies back in the pan & then poured the sauce on top & let the meat tenderize & finish cooking after turning the burner off. My friend & daughter LOVED it & my girlfriend who loves pepper steak but don’t like to eat peppers. I know weird lol. I have made this 5 days in a row last week because they keep requesting for it. We like a little juice or sauce, just enough to cover the rice but they can’t get enough of it. I’m tired of making it already lol. Keep posting. If you could do a recipe for black pepper chicken like the Chinese restaurants, I would lose my mind! Thank you for the awesome recipe. I made this last night and it was delicious (love the sauce) and simple to make! I’ll make this often and it will replace the recipe for pepper steak I used to make. Thank you for sharing an incredible recipe! Great recipe. We really loved it. However, at the beginning where it has a total cooking time of 35 mins, it really should be at least an hour if you’re cooking the meat in the water for 45 minutes. How is the total time 35 mins if the steak has to cook for 45 mins ? Hi Lily, thank you for bringing this to my attention. It was a glitch in the recipe card and I have fixed it. This looks really good! Glad I found your site. Hi Mary, 2 cups of water will evaporate quickly while cooking, but it will give the steak enough time to cook until tender. The gravy will be a little thick but the cornstarch will make it creamy and silky smooth! 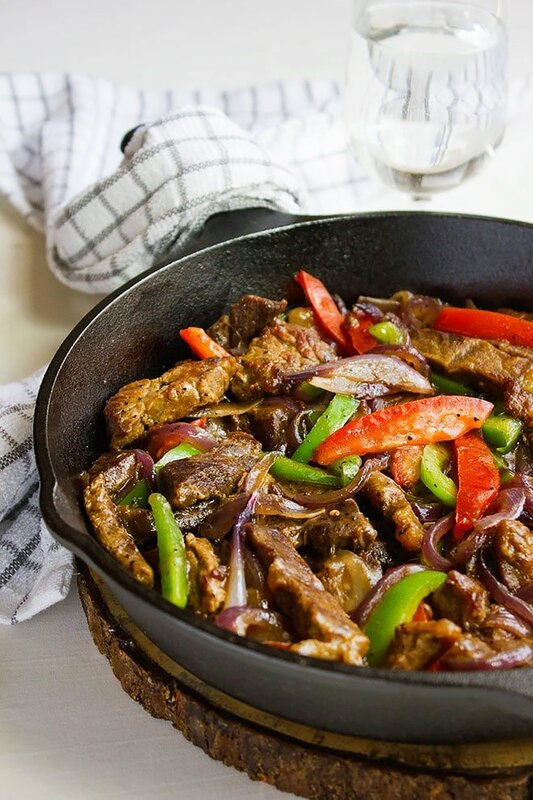 I have tried many pepper steak recipes over the years. I grilled chuck steak yesterday and had some leftover. Decided to make pepper steak with it. I searched and found your recipe. Followed it as written. Truly the best. So sweet of you to say so 🙂 thanks a lot for your kind comment and I’m glad that you’ve enjoyed it. I made this today and it was freaking delicious. My family loved it!! Thank you so much. The sauce, onions and peppers were delicious. However….I bought a nice piece of chuck steak, cut it up and cooked according to directions and 2 hours later it was still like shoe leather. I had some uncured beef kielbasa that I cut up and used instead and it was really good. Think I would go with a much higher quality of meat next time. Glad that you gave my recipe a try!